The OM-CP-HITEMP140-FR is a high temperature data logger with an ultra-fast response time to record temperature during rapidly changing thermal processes. This high temperature data logger features a 50 L x 1.59 mm dia (2 x 0.0625") probe and is capable of recording up to 4 Hz, which is 4 times faster than other data loggers in this class. This allows the temperature sensor to quickly adapt and accurately record temperature variations in changing environments. Applications include oven profiling, steam sterilization, autoclave verification and mapping, seafood processing, flash freezing and more. 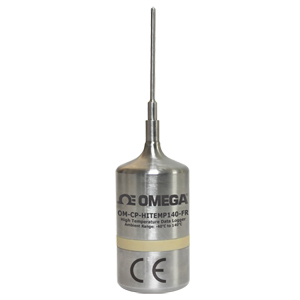 The OM-CP-HITEMP140-FR data logger is designed with food grade stainless steel. The device can be placed in environments up to 140°C (284°F) and the probe is capable of measuring from -200 to 260°C (-328 to 500°F). The OM-CP-HITEMP140-FR is also available with an optional thermal shield enclosure to extend the operating range of the data logger to -200 to 250°C (-328 to 482°F). The OM-CP-HITEMP140-FR-TSK (Thermal Shield Kit) comes with either a vented or flush top enclosure to accommodate a multitude of applications. The Trigger Settings feature of the OM-CP-HITEMP140-FR allows users to configure high and low temperature thresholds that when met or exceeded, will automatically start or stop recording data to memory. This data logger is capable of storing up to 32,700 date and time stamped readings and features a nonvolatile solid state memory which retains data even if the battery becomes discharged. The OM-CP-HITEMP140-FR utilizes the latest software. Data can be viewed in graphical or tabular formats and summary and statistics views are available for further analysis. The software features export to Excel®, data annotation, digital calibration and more.